What Kind of Music Will We Be Playing? What Is This Crazy Wiki, and How Do I Contribute? 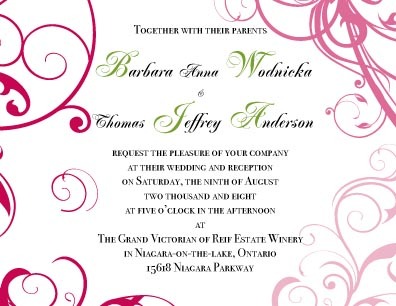 Welcome to Jeff and Barbara's wedding wiki! We encourage everyone attending our wedding to contribute any information concerning when they are coming, where they're staying, and any other wedding related logistics. It's extremely simple to create new pages, modify existing pages, as well as start a conversation for a specific page. To do so, you will first need to create a user account. If you find this whole wiki concept confusing or crazy, I recommend that you take a look at the " Wikis in plain English video ".There are some very simple help pages, and of course feel free to reach out to moc.liamg|niwtnosrednayerffejsamoht#ffeJ or moc.liamg|97alerabrab#arabraB and we'll be happy to assist!